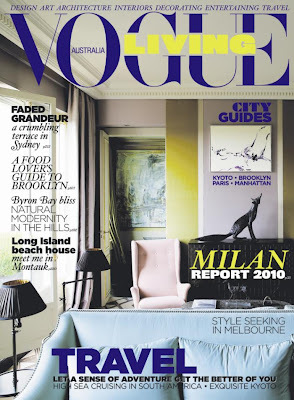 If you don't already have the July/August 2010 issue of Australian Vogue Living, run, don't walk to the nearest newsstand! This issue is one of their best and includes a fun story about eating in Brooklyn and a feature on the Montauk home of Robin Standefer and Stephen Alesch of Roman and Williams which you can also see here. But what really stopped me in my tracks was a gorgeous Paris apartment designed by Baroness Bruno de Pampelonne for a young Russian woman who received it as a birthday present (must be nice huh?!). The Baroness whose name is Rose Anne, worked on the space with architect Florence Lopez and what's surprising is that it's so different from her own Paris apartment that was seen in Elle Decor. 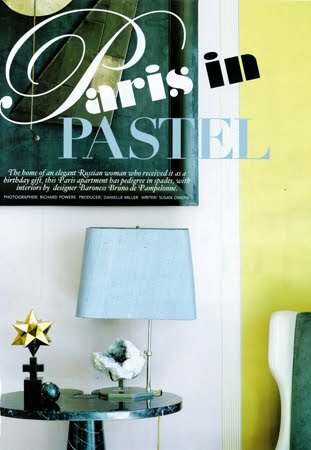 The title of the article, Paris in Pastel, suggests that the apartment is full of pastel colors but it's not at all saccharine or sweet. 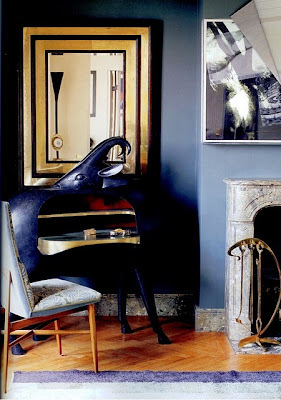 Lots of black and gold accents and marble, as well as a top notch art collection keep it sophisticated and modern. It actually reminds me a little of Kelly Wearstler's home. The photos below are only a few of what is quickly becoming one of my all time favorite interiors. Enjoy! Artwork by German artist Katja Strunz hangs above a table by Angelo Mangiarotti. The lamp with pale blue shade and mounted crystal is by Bagues. If I had seen this apartment last week, I could have included it in my mirror post. 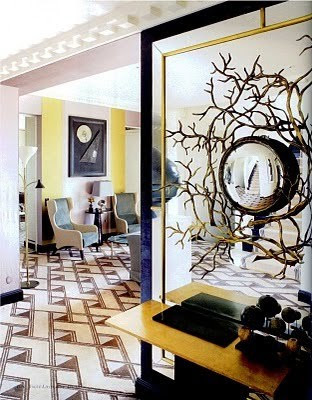 Here, an Hervé van der Straeten mirror hangs over a mirrored wall panel. The Baroness designed the carpet. The sheep desk, "Mouflon de Pauline" is by François-Xavier Lalanne. The Baroness is quoted in the article as saying, "You know when Tom Ford, Marc Jacobs and Peter Marino started to buy Lalanne, the prices for his furniture skyrocketed." The Ico Parisi chair is covered in a Brunschwig & Fils fabric. In the guest bedroom, striped leather walls by Elitis are a perfect backdrop for a work by James Nares and sconces by Objet Insolite. 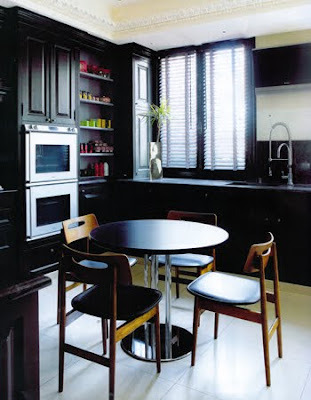 The black kitchen features a Thonet dining table.